Yuk sung is a traditional Chinese dish that's usually made with pork mince and fried noodles, served in iceberg lettuce. 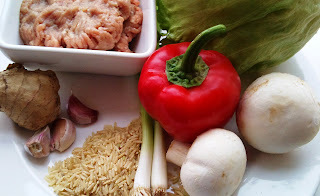 In this lower fat version, I swap the pork for turkey and fried noodles for brown rice, the result is just as as nice! We've joked that this dish should be the chief recipe given by the lettuce marketing board! It's crispiness is a great background to the oriental flavours. The dish would be great for a Friday night treat and will well and truly banish any idea of ordering a Chinese takeaway. • 250g turkey mince. (You could also use lean beef or pork mince). Heat a medium pan over a high heat. Add the boiling water and bring back to the boil. Crumble the stock cube into the water and stir to make sure it's combined. Then add the brown rice, stir and return the pan to the boil. When it's back to boiling for a minute or so, reduce the heat to medium and let it simmer away for 40 minutes. Next, heat a separate pan to a high heat. When hot, add the mince and dry fry it for approximately 8-10 minutes, until it's browned slightly and cooked through. Break down any lumps that form. When done, transfer the mince to a plate and leave to one side. Next, add the chopped mushrooms to the pan and stir fry for approximately 5 minutes. When done, add the mushrooms to the plate with the mince. Next, add the chopped red pepper to the pan and stir fry for approximately 5 minutes. When done, transfer to the place with the mince. Next prepare the lettuce. The easiest way to do this to take the lettuce with the stalk pointing up. Then cut through the base of the leaves at the stalk. Then wiggle the leaves until they start to separate, trying not to tear them. Trim and discard any damaged or discoloured bits. Rinse well and pat dry with kitchen paper. When the rice is ready. Drain well into a sieve and leave to one side. To complete the dish. Heat a large frying pan or wok on a high heat. When it's very hot add the oil. Then add the ginger and stir fry for a minute. Add the garlic and continue to fry for another 30 seconds or so. Next add the spring onion and fry for a further minute or so. Next add the mince, peppers and mushrooms back to the pan and stir to combine for a further minute or two. Add the oyster sauce, soy sauce, sweetener, cooking wine and water and stir well and continue to fry for a minute or so. Remove briefly from the heat and stir in the water /corn flour mixture. Return to the heat and the mixture should thicken, stir well to coat all the ingredients. Let the sauce bubble for a minute or so. If it's too thick, add another splash of water. If too watery, you can add more corn flour water mixture. Finally, add the rice to the sauce, mix well and add a good dusting of white pepper. Serve in one large bowl to be shared between two. 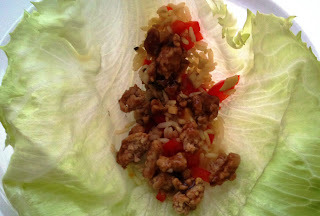 To eat, scoop 2-3 tablespoons of the mince mixture into the centre of the lettuce leaf. 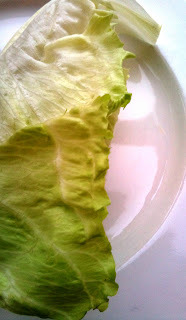 Wrap the sides of the leave around to make a roll and eat with your fingers. I discovered your blog while looking for a low-fat yuk sung recipe and I'm so pleased I stumbled across it - my goals are the same as yours and I know I'll be using your blog as a resource for future meals! Thank a mill for the feedback and I'm glad you like the site. Best of luck with your goals and let me know how you get on with the recipes.